I have a concept to share from the planned Von Herling, Vampire Hunter work that I’m planning. The idea is that the hero, August Von Herling, is a teenage equivalen to Abraham Van Helsing and Rudolph Von Richten. (Yes, he’s an anthropomorphic red fox.) In spite of his adolescence, I wanted to have the character convey that he has a focus and wisdom beyond his years. Crossed candlesticks make a convenient makeshift crucifix too. FYI, this is meant as a reference to the 1958 Hammer film, Horror of Dracula. Everything is okay with me. I’m still getting settled in here in my new apartment in Greensboro, North Carolina. Anyway, I have an announcement to make. It is my aim to put out two trade paperbacks in 2014. 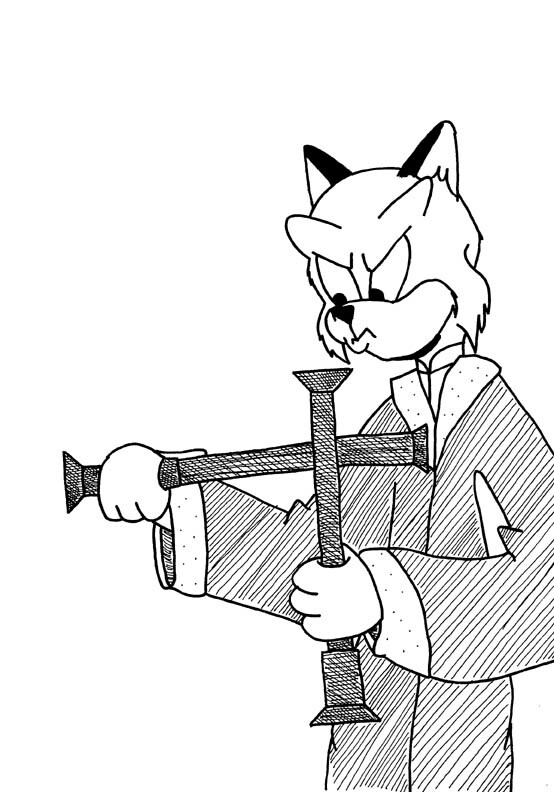 The first will be the second volume of Sunnyville Stories, my main series. The other book will be different from my usual fare. The tentative title is Von Herling, Vampire Hunter. The book is planned to be a black & white graphic novel and will be magazine sized (about 8.25×10.75 inches). The story is about a young vampire hunter who arrives in the fictional town of Richten, Tennessee tracking down a dangerous villain from Klausenburg. Von Herling will borrow heavily from the original novel of Dracula by Bram Stoker as well as the 1931 film of the same name with Bela Lugosi and the 1958 Hammer classic Horror of Dracula starring Peter Cushing and Christopher Lee. My work is intended to be more of a return to the original sort of vampire stories, which depict the primary villain as an evil and vicious creature – in contrast to more contemporary media showing vampires as romantic, sympathetic, or just misunderstood. The title character, Von Herling, is more of a character along the lines of Abraham Van Helsing and to a lesser extent, Rudolph Van Richten from the game Ravenloft. Rather than being an action hero using swords, guns, flamethrowers, etc, he’ll be more of a science hero who uses his mind to outsmart his opponents. Sadly, I have no artwork at present to show you. My work so far has been on writing a story treatment and using the above films (the 1931 Universal classic Dracula and Hammer’s Horror of Dracula) that I haven’t had time to devise any sketches yet. But that will be changing soon. Stay tuned to this blog for further details. No post for this week…I’m busy moving into my new place in Greensboro, North Carolina. 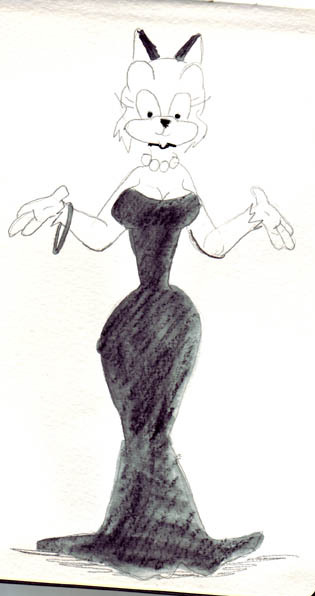 Hilda has closets full of various dresses. Among them are formal wear for when she goes out or is at a fancy ball. Again, diluted watercolor really comes in handy. Depending on how you dilute it, you can get all kinds of neat effects. This drawing of mine from the Moleskine book reminds me of a Japanese ink painting.